Collecting is one of the fundamental habits of GTD. It means writing down everything that comes to your mind so you can avoid having to think about it. Besides collecting stuff with the application itself, you can also do it via your email, via external tools as Evernote and Twitter, and through your Smartphone. Write everything. Do not think much about it, just write it down. Then click the Collect button (CTRL+ENTER) and the stuff will be added to your Inbox. Use the ESC key to exit once you have collected everything. There is an exception. If you collect something with a due date (using the in-line command :day), the item will go directly to the Calendar, bypassing the Inbox. There is a bar with the tags you use the most so that you do not have to type them. Click on them and they will be added to the text. Although you can collect more information, notes and checklists, you should not do it unless you have that information at hand at the time. If not, do not waste time, just capture fast and you will complete the information on the stage of processing. Click the Inbox option on the left-side menu to see all the stuff you have collected so far. If you are working with your computer, we recommend you to keep open the FacileThings app, so you can collect anything quickly and easily. You can also collect stuff into FacileThings using your email. You just need to send an email to the address inbox@facilethings.com. A new item filled with the subject text will be added immediately to your Inbox. It will have a note attached with the whole message. For more information, see this guide with all the options available to collect stuff in FacileThings via email. You must specify which Evernote notebook you want to use to collect things. All the notes you add to that notebook will be sent to your Inbox. With Twitter, you just need to mark a tweet as I love it (heart-shaped icon) for it to appear in your FacileThings Inbox. You don’t need to wait after clicking the sync button. You can continue working. The synchronization is done internally without affecting your work on the web. Depending on the amount of data to be synchronized and the number of jobs FacileThings has accumulated, the proccess may be immediate or take a few minutes. 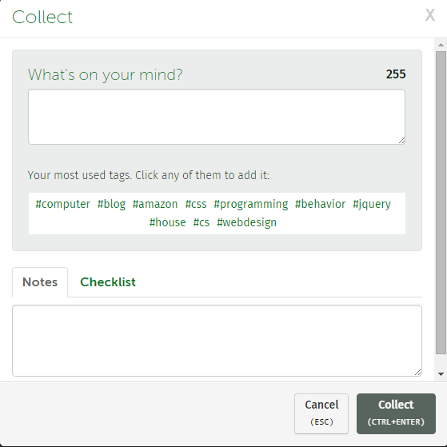 Note: Please note that FacileThings tags are formed by a single word, while Evernote allows you to enter spaces within them. 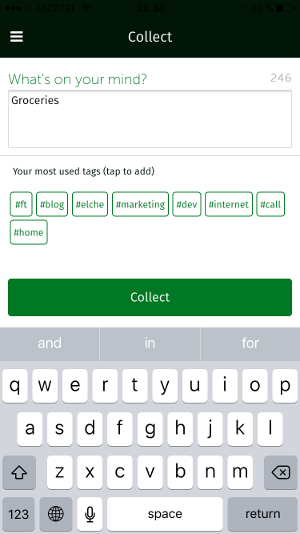 If you use Evernote tags with spaces, only the first word will be imported as a tag. You can also collect stuff using our web app for mobile devices. You just need to type https://mobile.facilethings.com in your mobile browser to access the web app. Add this address to your bookmarks or create a shortcut icon to the application.